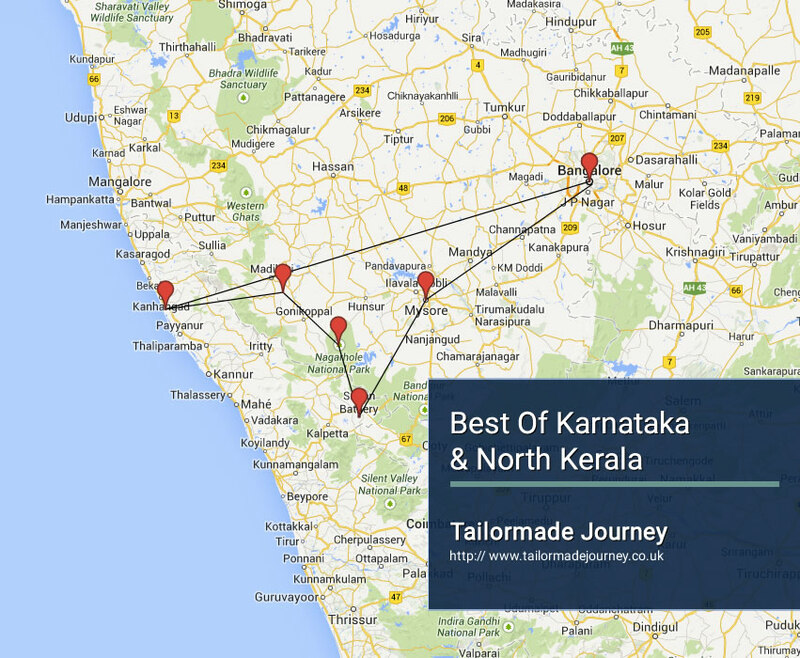 This tour provides total relaxation and rejuvenation in places of Karnataka and Northern Kerala. And Wildlife at the Nagarhole Sanctuary. Arrive Leave Bangalore > Flight & Drive Neeleshwar 3 Nights > Drive Coorg 2 Nights ( Coffee Plantations ) > Drive Kabini 3 Nights ( Wildlife Sanctuary ) > Drive Sultan Battery 3 Nights > Drive Mysore 3 Nights > Drive Bangalore 2 Nights & Leave. Neeleshwar Hermitage is a place where one can gain deep rest, release the burden of the past and rejuvenate. Overnight stay at the Hotel in Neeleshwar. After breakfast leave by Private Vehicle for Coorg. Upon arrival in Coorg check in at your pre booked Hotel. Coorg also known as madikeri means dense forest on Steep Hill. Dubbed as Scotland of India, this town has a lot to offer to the tourist. Misty hills, Lush Forest acres and acres of tea and Coffee Plantation. Coorg is on the Western Ghats. Set amidst verdant valleys, imposing mountains and teak wood forests, this is one of the most beautiful hill station. After breakfast leave by Private Vehicle for Kabini. Upon arrival in Kabini check in at your pre booked Hotel. Kabini is the first conserve wildlife sanctuaries of Asia. It is a natural habitat of tiger, elephant, and many other wild animals. Overnight stay at the Hotel in Nagarhole. Morning and Afternoon spent visiting the Park. After breakfast leave by Private Vehicle for Sulthan Battery. Upon arrival in Sulthan Battery check in at your pre booked Hotel. Overnight stay at the Hotel in Sulthan Battery. Sultan’s Battery is a mid-sized town in Wayanad district of Kerala, India. It derives its present name from Tipu Sultan of Mysore who captured the Jain temple here and used it as his battery here in the 18th century, hence the name Sultan’s Battery. Day Free to explore your own. After breakfast leave by Private Vehicle for Mysore. Upon arrival in Mysore check in at your pre booked Hotel. Morning sightseeing tour of Mysore, Mysore a city of 17 Palaces – the Maharaja’s City Palace being one of the largest in the country, Including visiting the zoological gardens, the Chamundi Temple, handicraft Centre and 22 kms away – the Brindavan Gardens, which are a sight by day and night. Morning Visit Srirangapatnam – Tipu Sultans summer Palace. After breakfast leave by Private Vehicle for Bangalore. Upon arrival in Bangalore check in at your pre booked Hotel. Overnight stay at the Hotel in Bangalore. Morning City tour of Bangalore visiting Vidhan Soudha, Lalbagh Botanical Garden spreading over 240 acres and The Fort. Today you are transferred to Bangalore International Airport to board Flight for Onward Journey. Kaav Safari Lodge features an outdoor swimming pool. It has been artistically designed to please eyes and offers free Wi-Fi in hotel rooms. Kaav Safari Lodge is 3.5 km from Kabini Boat Ride and Nagarhole Wildlife Sanctuary Entrance. It is 72 km from Mysore Bus Station and Mysore Railway Station. The Calicut Railway Station is 142 km and Calicut Airport is 160 km. The Bengaluru International Airport is 215 km. Attached with a balcony and offering a view, the well-lit air-conditioned rooms are equipped with tea/coffee maker, fan and wardrobe. The private bathroom includes a hairdryer, shower and free toiletries.The property provides services like luggage storage, safety deposit and laundry. Guests can take a relaxing stroll in the garden. All travel arrangements can be done at the travel desk. Coorg International is the only hotel in Coorg which offers all three star facilities, including a swimming pool and health club and is located near the valley town of Mercara. Hotel Coorg International has long been known for its convenient location (Close to just about everything - adventure sports, wildlife, a lazy afternoon spend on a coffee estate or even visits to places of historic interest) and of course, the food. Hotel Offers Well furnished rooms, Epabx, Cable TV, Travel Desk, Indoor Games, Conference, Banquet Hall, Doctor on call, Currency Exchange, Health Club & Swimming Pool and Golf Course - 18 HOLE. Edakkal Hermitage is a resort that aims to call attention to the little known Edakkal Caves and the beauties of eastern Wayanad. This is boulder country and the rooms at the resort are built around the rocks. The resort is on a smaller parcel of land and the theme of rocks and caves is beautifully echoed here. A tiny, spanking new tree house, for a very intimate couple is an easy climb up a bamboo ramp and gives you views out to forever. The terraced premises are exquisitely laid out, with soft grass and veils of Jacquemontia. The hospitality is unobtrusive and there is a home- stay feel to the dining. The jackfruit thoran and morkuzhambu are to die for, and when we get our morning appams we hurry to pour coconut milk over them before they float out of reach. At night, dinner in a cave is a magical experience. On other nights, we are told, tables are set up under the stars on the stage of the amphitheatre. The same amphitheatre the next morning is ideal for bird watching. The surrounding trees are teeming with golden orioles, red cheeked bulbuls, coppersmiths, drongoes and tiny flitting things that hide in the shrubs. In the infinite distance the hills float on an ocean of mist. The caves themselves, a vigorous climb from the resort are not to be missed. Apart from the mystery of the inscriptions and Neolithic rock art, the boulders that shape them are astonishing. A deep fissure on the far side gives us a clear view out to Phantom Rock, many miles away. The fissure was caused by an earthquake and reminds us of the fragility of even this massive natural formation and its hard document of the human presence.” Resort has Seven cottages as part of the residential accommodation available at Edakkal. Design wise, all of them have evolved organically and are completely different from each other. Neeleshwar Hermitage is located in Bekal. Free WiFi access is available in this resort. The accommodation will provide you with air conditioning and an iPod dock. Featuring a shower, private bathroom also comes with a bath and a bath or shower. Extras include a safety deposit box, bed linen and a fan. At Neeleshwar Hermitage you will find a restaurant Other facilities offered at the property include a shared lounge, luggage storage and a children's playground. An array of activities can be enjoyed on site or in the surroundings, including cycling. The property offers free parking. This resort is 81 km from Mangalore International Airport.